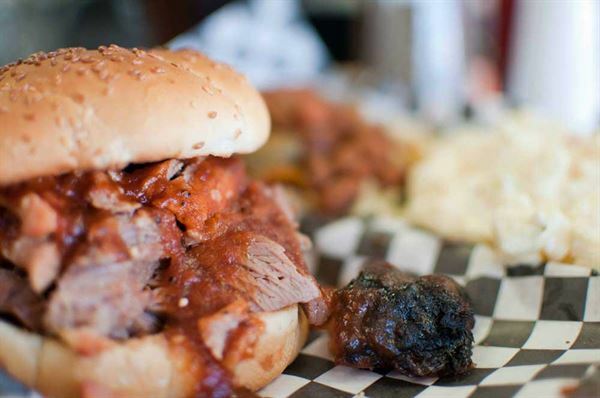 Whether you want to enjoy a smoked beef brisket smothered in savory barbecue or a finger-liking rack of barbecue ribs, we've got you covered. Abbey's Real Texas BBQ is proud to bring the taste of authentic Texas style BBQ to San Diego! Bring your family and friends and see what all the fuss is about. Package price is per 10 people. Plan a big event with Abbey’s Real Texas BBQ. We will cater any size party or event at your home, office, or park & beach! We can customize your menu for any party or event. Enough BBQ Chicken for 10 for lunch or dinner. Served with choice of one side dish, Caesar salad, toasted garlic rolls and homemade cookies to complete the meal. Plan a big event with Abbey’s Real Texas BBQ. We will cater any size party or event at your home, office, or park & beach! We can customize your menu for any party or event. Serves 10. Select two different meats for your fully prepared sandwiches, Caesar salad, a choice of one side dish, and homemade cookies to complete the meal. Sandwiches are on 5” rolls. Condiments are served on the side. Plan a big event with Abbey’s Real Texas BBQ. We will cater any size party or event at your home, office, or park & beach! We can customize your menu for any party or event. Enough baby back pork ribs along with BBQ chicken to serve 10 for lunch or dinner. Served with choice of one side dish, caesar salad, toasted garlic rolls and homemade cookies to complete the meal. Plan a big event with Abbey’s Real Texas BBQ. We will cater any size party or event at your home, office, or park & beach! We can customize your menu for any party or event. Serves 10 for lunch or dinner. Served with choice of two sliced meats, two side dishes, Caesar salad, toasted garlic rolls and homemade cookies to complete the meal. Plan a big event with Abbey’s Real Texas BBQ. We will cater any size party or event at your home, office, or park & beach! We can customize your menu for any party or event. Enough beef or pork ribs for 10 for lunch or dinner. Served with choice of one side dish, Caesar salad, toasted garlic rolls and homemade cookies to complete the meal.